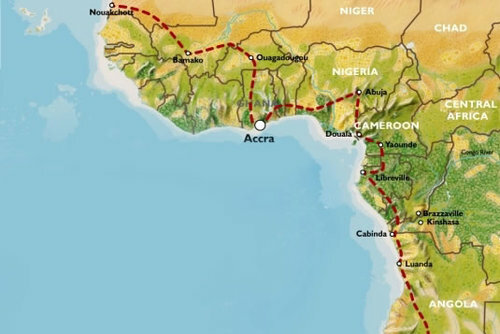 The words 'Cape Town to Cairo' conjure up images of African expeditions from days of old. Even today there are a multitude of challenges that this vast continent can throw at you. Desert, river, & mountain crossings are inter-twined with stunning National Parks & some of the best adrenaline fuelled activities & playgrounds in the world. This is a trip that will linger in your memory long after completion. We depart Cape Town and drive northwards for a day through the Cederburg Wilderness Area, an area of rugged valleys and peaks. We cross the border at Orange River and enter Namibia. The semi desert is quite a contrast to the more fertile terrain we have been used to. The night sky ablaze with shooting stars and the warm glow of our campfire makes for unforgettable camping experiences.Our first stop in the amazing country is at one of Africa's most sensational natural features, Fish River Canyon. We stop here for a couple of hours to take in the awesome scenery. 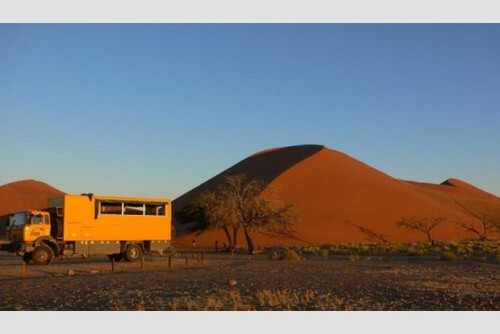 A one day drive takes us to the Namib-Naukluft Park, a vast expanse of desert which contains some of the highest sand dunes in the world. At Sossusvlei we stop and explore the area and the dunes. For the next three days, we will be based in Swakopmund - Namibia's adventure gateway. 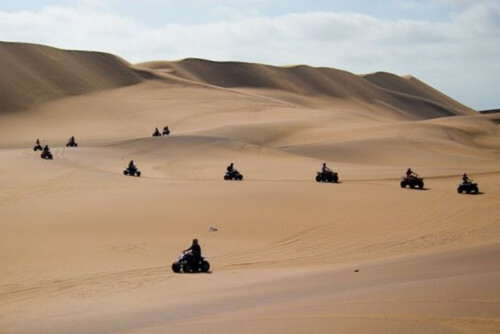 You can choose between a variety of activities and excursions here: spend a day deep sea fishing for shark and other game fish or head out to the desert and try quad biking and dune sledding. You can also go horse riding or get a birds eye view of the dramatic coastline - either by Sky diving from 10,000 feet or take a flight over the towering sand dunes in the area. In Swakopmund itself you can walk along miles of deserted beaches, visit the museum or relax in a cafe. After leaving Swakopmund, we travel to the stunning Spitzkoppe Rock formations. Known as the Matterhorn of Namibia - the Spitzkoppe is part of the Erongo Mt range and was formed over 100 million years ago after the collapse of a gigantic volcano. The scenery is striking from every angle - even more stunning as the granite massifs turn red at sunset. Next stop is the world famous Cape Cross Seal Colony, where the sight of thousands of these mammals, as well as their accompanying pungent odour is remembered by all! The Cool Atlantic Ocean and the prominent Benguela current provide a perfect location for feeding and breeding for the Cape Fur Seal. Passing through Brandberg Mountains in Demaraland -we pay a visit to a local Cheetah Park and get up close to these amazing and endangered creatures, before heading onto Etosha National Park. 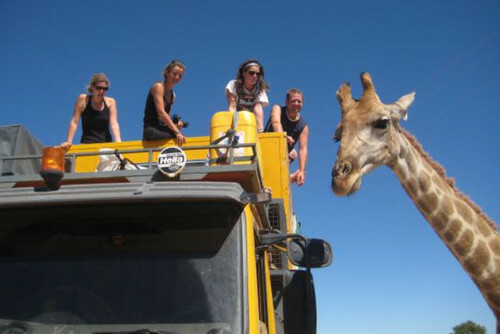 Etosha is recognised as one of the world's greatest wildlife viewing areas. Besides game drives we can also game watch by night at one of the floodlit water holes where we may well spot Rhino, Elephant and Giraffe among a host of other wildlife. From here we then head east and cross into Botswana where you will have an opportunity to leave the truck for a few days to venture into the Okavango Delta. Local poler guides will navigate the extensive waterways using canoes similar to their traditional Mokoro's (dug out canoes). This is a great experience - and the best way to have a chance of seeing the elusive wildlife of this unique desert oasis. You will have a number of opportunities to go on game walks with rangers - giving you the chance to see elephant, crocodile and hippo up close and personal. The Okavango Delta is one of the world's largest inland waterways and its calming serenity will leave those who experience it feeling supremely relaxed. 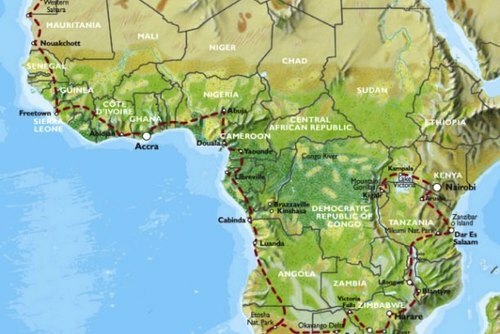 There is also the opportunity to experience the heights of African adventure travel too: see the delta from the air during an hour-long flight. 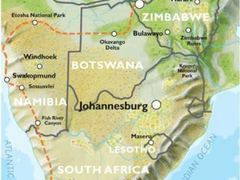 We continue heading east into the Kalahari Basin - known for its dry, desolate and expansive freedom. We spend the night on the outskirts of the Chobe National Park - famous for its hordes of Elephants, as well as an abundance of other wildlife. You will have a chance to spend the afternoon on the Chobe River - a less intrusive way to view game and wildlife - as well as the Namibian frontier across the river. Crossing into Zimbabwe - we stop for several days at one of the adventure playgrounds of the world - Victoria Falls. 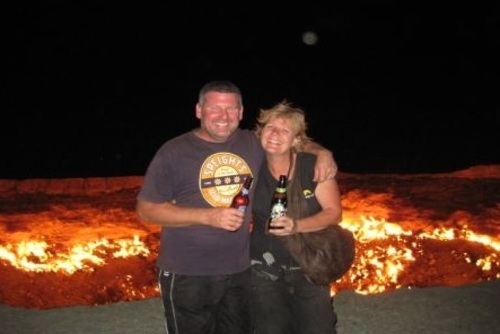 For some, Mosi oa Tunya - The Smoke That Thunders, is the highlight of their African safari. From the main road, in the bush 20kms away, a cloud of mist and spray can be seen against the blue sky. As you get closer, a low rumble like thunder can be heard. When you arrive it is a surprise to discover the enormity of Victoria Falls. One mile wide and hurling over 5 million cubic metres of water a minute into the Zambezi Gorge this is the setting for the most adrenaline fuelled grade 5 white water rafting in the world. There is something here for everyone to end off this Kenya to Zimbabwe safari: A day trip over the Victoria Falls bridge to view the falls from Zambia, Flight of Angels - a great way to get a birds eye view of the falls in a light aircraft or helicopter, Sunset Boat Cruises or a more sedate Canoe trip, to the adrenaline packed Gorge Swing, Abseil or a chance to experience one of the highest commercial Bungee Jumps in the world. After your adrenaline has been spent - it's a days drive through Matabeleland to Bulawayo. You have the option of leaving the truck for a day to venture into Matobo National Park with a local safari company. You will have a unique chance to get out on foot to try and spot the elusive Black Rhino - amongst hordes of other game. There is also the opportunity to visit Cecil Rhodes' grave and Ancient Rock Paintings. From Bulawayo we travel across Mashonaland to the Great Zimbabwe Ruins which was once the greatest medieval city in Sub Saharan Africa and where the name Zimbabwe is derived, literally meaning house of stone. We continue to Gweru where we visit a privately run horse and game ranch where you can go game viewing on horseback or even take a walk with Lion Cubs! Its our destination for the next few days and always a highlight! We make our way to the Eastern Highlands of Zimbabwe, we will either visit Chimanimani National Park or Vumba Gardens, where you have the opportunity to take a hike through the mountain wilderness area, or hiking to the nearby bridal veil falls, or simply enjoying the stunning surroundings from this sleepy village whilst strolling through the village market. Heading north via Harare - we cross the border into Mozambique. We follow the infamous 'Tete Corridor' which was well known in the days of Mozambique's long running civil war as the 'Gun Run'. Thankfully these days things are a lot different! We continue on to the capital Lilongwe in the south of the country where we stop for two nights. This will give you the opportunity to post gifts home, play a round of golf or check out the local markets. The next country on our journey is Tanzania, and after a day and half drive we pass through the peaceful Mikumi National Park. 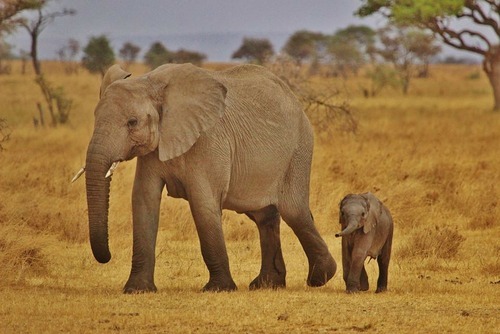 African safari travel is synonymous with wildlife, and in this national park we usually see Elephant, Giraffe, Zebra and Antelope from the roadside. From here we continue travelling through the interesting and mountainous hinterland of Tanzania. 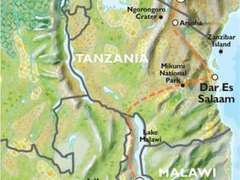 Our route north then brings us to Dar Es Salaam where our truck is based for around 4 nights in a campsite on a beautiful Indian Ocean beach. From here most people take the ferry out to Zanzibar for the full four days and venture into the narrow bustling streets of Stone Town and its famous spice markets, old slave forts and dungeons. There is also time to relax on Zanzibar's famous white beaches , scuba dive or snorkel and swim with dolphins! After leaving Dar Es Salaam we pass a number of small towns and villages along the way and, if we are lucky, we may see the towering peak of Kilimanjaro. We will stop off at Marangu where you have the opportunity to climb to Kilimanjaro base camp, or take a walk through the lush surroundings passing through coffee plantations, rivers, waterfalls, caves and visiting a local blacksmith. We then continue to Arusha, at our camp on the outskirts of Arusha you have the option to use a local African safari travel company to guide us through Ngorongoro Crater and Manyara National Park. 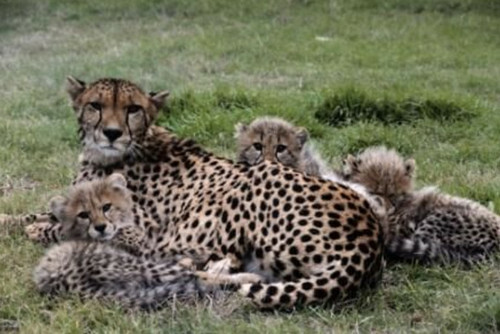 In these parks you will have the opportunity to view the abundant wildlife including Elephant, Lion, Cheetah, White Rhino, Buffalo, Hippo, Antelope, Crocodile and Pink Flamingos. From here you can also choose to go into the Serengeti National Park for a day where vast herds of wildebeest roam the plains. For those who wish - there is an option to visit a local Maasai Village and learn about their culture and way of life. Making our way to Kenya we pass through hot savannah grasslands where acacia trees provide the only shade. Various game, usually zebra and giraffe can be seen as we head over the border. 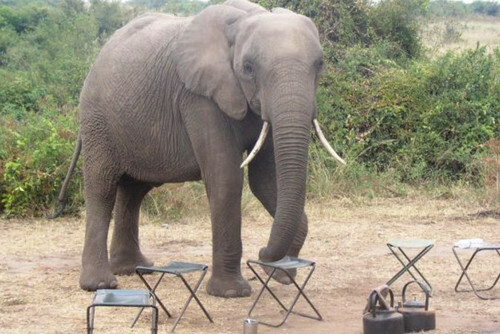 Once in the capital Nairobi, we stay in a private campsite on the edge of town. Our time in Nairobi will give you a chance to relax ,drink an ice cold beer and catch up with world news & events with English language newspapers. From here you have the opportunity to visit the Sheldrick Elephant Orphanage, where Oasis helps support one of the elephants (Kamboyo).A great experience to see the nursery animals come out for their daily mud bath and comical play and to see the amazing work the centre does with rescued and injured elephants and rhino. Nearby is the Langata Giraffe Centre, where you can learn more about these gentle and majestic creatures - hopefully getting the chance to get up close to feed them. 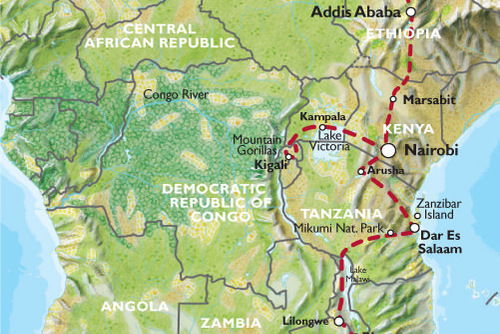 Our trip continues from Nairobi and heads north into one of Africa's greatest natural features, the East African Rift Valley. Stretching from the Dead Sea in Jordan down to Mozambique in Southern Africa, our first view is from the top of a steep escarpment. Overland trips through East Africa will allow you to experience some of the most dramatic scenery in the world, and the Rift Valley is a definite highlight. 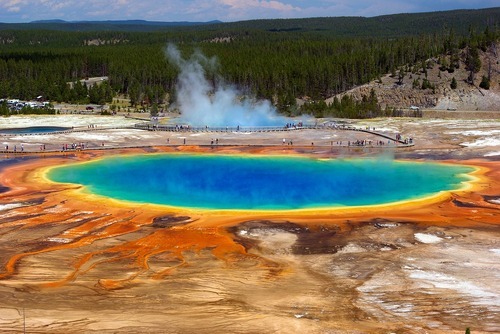 The valley floor seems to sweep on forever and is dotted with volcanic peaks, shimmering lakes and countless springs. Our journey takes us into the heart of the Rift Valley to Lake Naivasha. We camp near the lakeshore where Hippos sometimes feed at night! Here you can walk to Elsamere, the house of Joy Adamson - of Elsa the Lion and Born Free fame, and enjoy a film of her life - and cream teas! You can also hire mountain bikes and cycle or walk through Hells Gate National Park - the only game reserve in Kenya in which you are permitted to do so.Or for a less active but equally enjoyable game viewing experience - visit the Crater Lake Game Sanctuary. Both offer excellent scenery & opportunities to spot hyrax, abundant bird & plant life along with several types of gazelle, impala and eland. A further half day drive through hills covered in tea plantations and rural scenery drive brings us to Lake Nakuru National Park - home to a wide variety of wildlife including Black Rhino, Hippo, Lion, Leopard, Hyena and Giraffe. However, Nakuru is a soda lake and most famous for its pink inhabitants, a flock of almost a million Pink Flamingos which feed noisily along the shoreline. A mountainous drive with spectacular scenery through the Nandi Hills brings us to our next stop at Eldoret. From here we cross into Uganda, and continue west to the capital. Kampala has had a turbulent past, but these days it is a friendly and safe city. We have a free day to spend in local cafes and nightspots - where you can get to know the local people. There is also the opportunity to spend the day visiting a local Chimpanzee Sanctuary and rehabilitation centre on one of the islands on Lake Victoria. The following day we have a long drive as we head west through swamps, patches of forest and fertile green countryside. 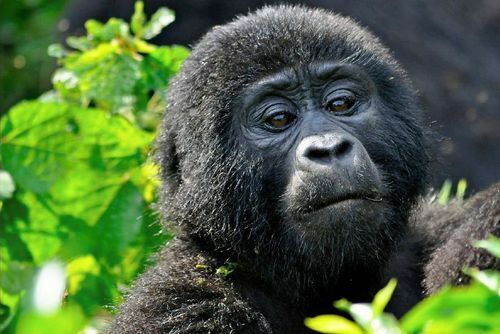 As we travel through Uganda, we'll pass through a number of small towns and villages; Mpigi, where you will see roadside stalls manufacturing and selling traditional musical instruments; Kyazanga, where we can buy fresh rotisserie and roasted meat and vegetables, as well as roasted plantain bananas. We will also be able to make a photo stop where our route crosses the Equator. We then return towards Kampala and camp near Jinja - Uganda's adventure playground. Here, on the edge of Lake Victoria, the Nile begins its 6700km journey to the sea. We spend the next few days downstream from the source of the Nile. 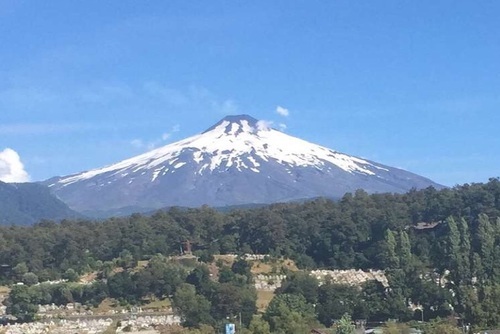 This is a spectacular area, and a superb place to go whitewater rafting or kayaking. 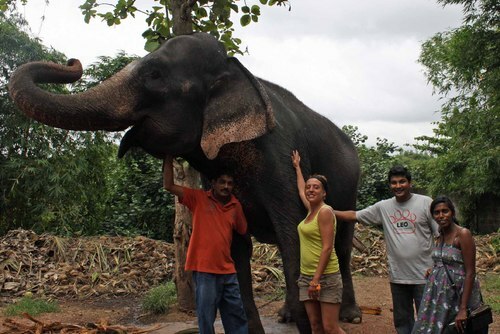 You can also organise quad biking , horse riding or a visit to a local education project. Re-entering Kenya, we travel around the foothills of Mount Kenya before embarking on the next phase of our journey. This leads us into the remoteness of northern Kenya - where we will encounter some of the worst roads on the entire trip. Nomadic tribes people like the Rendille in Marsabit & the Samburu (cousins of the Maasai) still wear very distinctive and often elaborate dress. As we cross into Ethiopia - many of the roads we travel on are very poor dirt or gravel roads and often in mountainous areas, so travel is slow. Ethiopia has a lot more visual & indigenous history than any other sub - Saharan country. We continue our journey north heading into the Omo Valley. This little visited region is home to some of the most colourful ethnic groups in Ethiopia. The friendly Hamar people are noted for their ornate, interesting hairstyles and the Mursi people are famous for the clay lip plates and earlobe decorations. 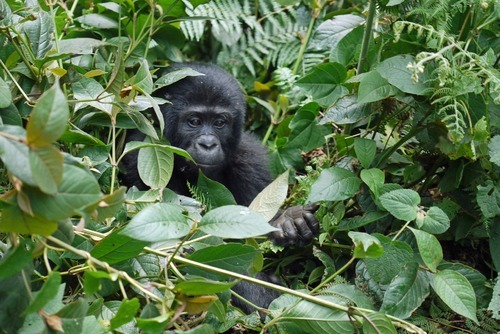 An optional 2 day tour will take you into the Omo National Park. We spend a couple of days in the capital Addis Ababa where we have the chance to indulge in some authentic Ethiopian coffee or explore 'El Mercato' - one of East Africa's largest open air markets. We also spend the next few days organizing our Sudanese and Egyptian visas - before heading onto Bahir Dar via the spectacular Blue Nile Gorge & Falls. Based on the southern edge of Lake Tana - you can organise boat trips to some of the small islands which have Monasteries dating back up to 900 years, and which are still looked after by monks who live from subsistence farming. In the towns of Bahir Dar and Gondar (the capital of Ethiopia from 1632 until 1868), we spend about 4 days at each - where it is possible to organise visits to some of Ethiopia's most famous sites, including the holy city of Axum and the rock-hewn churches at Lalibela. These date from the 12th Century and have been kept alive by generations of dedicated priests who guard their precious religious and artistic artifacts. The border with Sudan is not far from Gondar and the first towns after the border are Gedaref & Wadi Medani. The hospitality in Sudan can be surprising - but very genuine. For such a poor country with so many recent problems - Sudanese people are often too willing to invite you for a meal or a cup of 'Sudanese whisky' - better known as tea! Khartoum is our next stop and it has a fantastic setting on the confluence of the Blue and White Niles. Our stay here is on the banks of the Nile at the quirky but interesting Blue Nile Sailing Club. It houses one of General Kitcheners old Gunboats, a relic from the British military campaign against the Mahdi over a century ago. For such a large city, Khartoum feels quite laid back. Here you can visit the Hamed al Nil Tomb or take a trip to the daily camel market or viewing the confluence of the two Niles are also an interesting ways to pass the time. The ancient Pyramids at Meroe lie to the north of the capital Khartoum. Our drive across the Nubian Desert will see us either hugging the banks of Nile as it snakes its way north or possibly experiencing the vast open desert plains which is dissected by the main train line from Khartoum - making this our only real point of reference. Whether passing through sleepy Nubian villages ,resting in tea rooms, pottering around the local souqs or experiencing total isolation in the middle of the desert - a unique experience awaits you along this not so travelled route to Wadi Halfa. Upon reaching Lake Nasser and the port of Wadi Halfa in Northern Sudan, we board the ferry to Egypt - our ultimate destination on our expedition. The ferry takes about a day and a night and is a supremely relaxing way to travel, and a great opportunity to mix and chat to local Egyptian and Sudanese people alike. We rejoin our expedition vehicle which has travelled on a separate barge and make our way to Aswan. Here you will notice you will notice one of the many cultural changes on this trip - the darker Nubian people in Aswan lead a more relaxed and less hectic pace of life than their Egyptian countrymen. 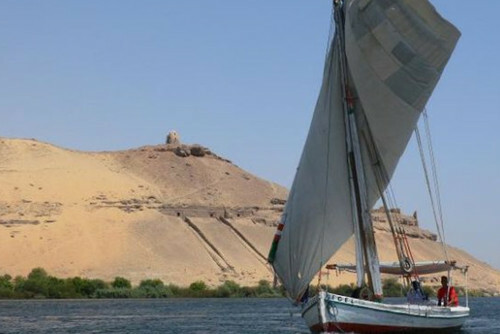 We base ourselves here for the next 3 or 4 days to finalise in which time you can join a 2 or 3 day felucca boat cruise to Edfu and Kom Ombo. The opportunity to visit Abu Simbel - the massive stone monuments built by the greatest of all pharaohs, Ramses ll, is always a highlight before continuing to Luxor. You will be kept busy exploring in Luxor - where we visit the Valley of Kings and Queens. Here, the remarkably well preserved tombs of the ancient rulers -namely Ramses ll and Tutankhamun -have coloured paintings and hieroglyphics that still seem fresh even after 3000 years. Karnak and Luxor Temples are both in easy walking distance from our camp - as is the local souq where you can pick up the last of your souvenirs. The following day we drive out towards the Red Sea Coast. You will have time relax on the beach for a couple of days or try your hand at various watersports such as snorkelling, windsurfing or scuba diving in the cool clear blue waters. Our final destination, Cairo is only a few hours away. Visiting the great Pyramids and Sphinx at Giza with our Egyptologist guide and also the Egyptian Natural History Museum in the afternoon is definitely a fitting way to end this amazing expedition.